First, I would like to offer my congratulations to the Men’s Basketball team for earning the #1 spot in the AP Poll for the first time since 1982! Student Council led a delegation of students to Capitol Square in Richmond to lobby alumni in the General Assembly and meet with Governor Northam and Lt. Governor Fairfax. During our visit we advocated for continued support of financial aid, improved access to civic engagement resources, and increased state support for UVA in order to keep tuition rates down. Please read below for important announcements and keep cheering on the Hoos at JPJ and on The Corner when our team is away! Six months after the events of Aug. 11 and 12, Cavalier Daily Editor-in-Chief Tim Dodson interviewed Law School Dean Risa Goluboff, chair of the Deans Working Group, and Brendan Nigro, a third-year College student on the Advisory Committee on the Future of the Historic Landscape. Watch here. Six months after the white nationalist rallies of Aug. 11 and 12, the Cavalier Dailyinterviewed student leaders from the Black Student Alliance, Jewish Leadership Council, the Minority Rights Coalition, the NAACP at UVA, and Student Council to talk about the impacts of the events on students at UVA and what kinds of initiatives and changes students are calling for moving forward. Watch here. Interested in the monthly progress of the Student Activities Building? Want to make sure the Administration is building the structure your CIO needs? As the Working Group for the Student Activities Building begins to make real concrete decisions, we want to extend an invitation for any student to stay up to date on the process. Fill out this Google Form to subscribe to newsletters and opportunities for feedback and involvement. 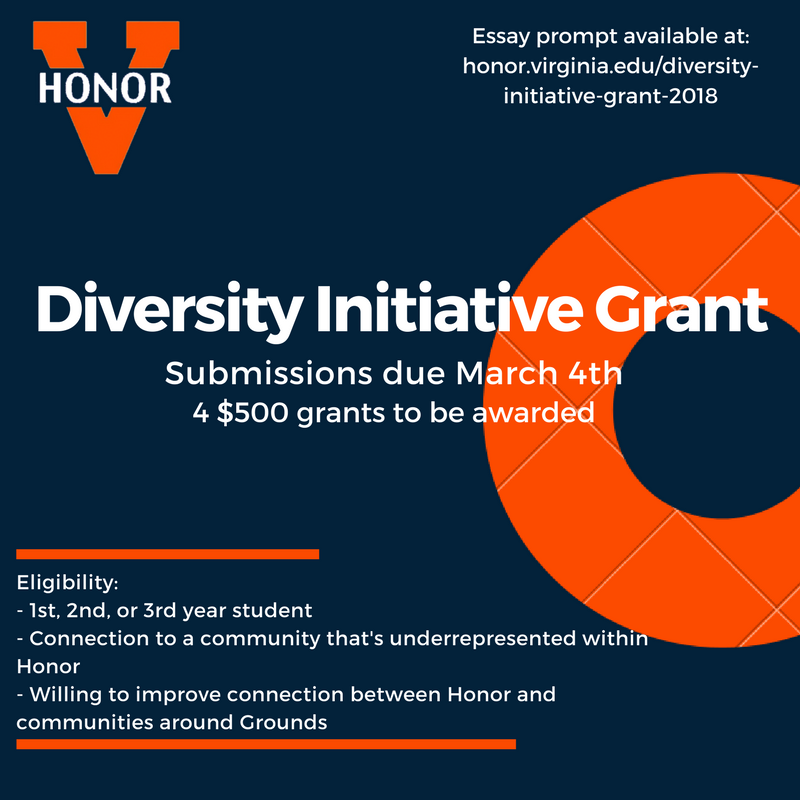 In an effort to create positive connections with more communities across Grounds, the Honor Committee is excited to reintroduce the Diversity Initiative Grant! First-, second-, and third-year students with the ability to bridge the gap between the Honor System and communities that are underrepresented within it are encouraged to apply. Visit the Honor website for information on how to apply and contact brandt@virginia.edu with any questions. Nominate a graduating member of the class of 2018 for one of the following class awards: Community Service, Cultural Fluency, and the Miss Kathy Award. Apply to serve as a Class of 2021 Second Year Council member, a Class of 2020 Third Year Council member, or a Class of 2019 Fourth Year Trustee. The opportunity to apply for the important role of Student Director for UVA’s Multicultural Student Center is still available! The Student Director functions as a member of the Multicultural Student Services team in the Office of the Dean of Students, plays an instrumental role in building partnerships across Grounds, and serves as a liaison to students University-wide. The core component of the Student Director role is to create alliances and collaborations with students and CIOs, as well as faculty, staff, and the broader University community. The Student Director also offers guidance and insight for projects coordinated by the Multicultural Student Center interns. Apply by Thursday, March 1, 11:59 p.m. 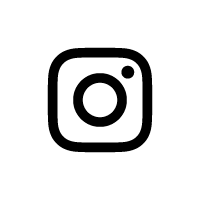 The Serpentine Society provides grants to highly-motivated lesbian, gay, bisexual, and transgender students with financial need. Current undergraduate and graduate students who attend UVA on a full-time basis can apply for a one-year grant. Decisions will be based on academic achievements, financial need, essays, extracurricular activities, and awards demonstrating exceptional commitment to bettering the LGBTQ community at UVA and beyond. Recipients can apply for grants again the following year. Applications will be evaluated on a rolling basis, but students should apply as soon as possible. Nominations due March 14 at 5 p.m. 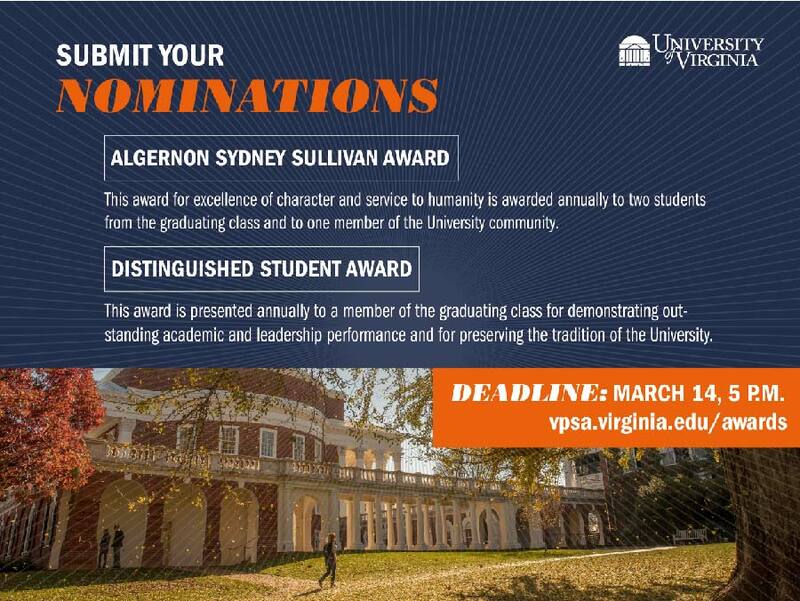 This award is annually presented to one man and one woman from the graduating class (undergraduate or graduate) and to one non-student member of the University community who best exemplify the high qualities of heart and mind of Algernon Sydney Sullivan’s life. Recipients of the Award should be individuals whose personal integrity, leadership, and unselfish service to the University are of the highest order. Visit the website for more information. This award is presented annually by the Alumni Association to a member of the student body who has won recognition in the University community for demonstrating outstanding academic and leadership performance and for preserving the tradition of the University. It is the purpose of the award to honor a student who has won the admiration of the University community for exceptional contributions in several areas of University life. Any nominee from the undergraduate, graduate, and professional student body is eligible if she or he is a degree recipient in May 2018. Visit the website for more information. Hosting a small club meeting, or perhaps a large community event that will have food? We can provide free cups/plates/silverware/etc. to help make your event zero waste! On Thursday, March 1, from noon to 3:30 p.m., Student Council will be holding a free STI testing event in the Newcomb PAC. Within this event, Student Council is partnering with Thomas Jefferson Health District to supply 90 free tests that are used for all three STIs of gonorrhea, chlamydia, and syphilis. Additionally, approximately 90 free HIV tests will also be available. The event will conclude when supplies run out, so be sure to show up early to ensure you take advantage of this opportunity. Please volunteer to attend a one-hour focus group session about the climate of sexual assault and the University’s efforts at prevention on Grounds during one of the times listed in the following Google Form. There are four time slots for these focus groups. Pizza will be provided. We really need volunteers in order to gain a deeper understanding of the overall sentiment of students on Grounds towards this issue of vital importance, so please attend if you can. Save the Date: Student Art on the Corner on Thursday, April 12, from 6:30 to 8:30 p.m. at OpenGrounds. This will be a showcase of projects that were granted funding from the Student Arts Fund.